This map shows the Bold Coast Byway, which the Washington County Council of Governments, in partnership with other organizations, is promoting through a marketing plan. 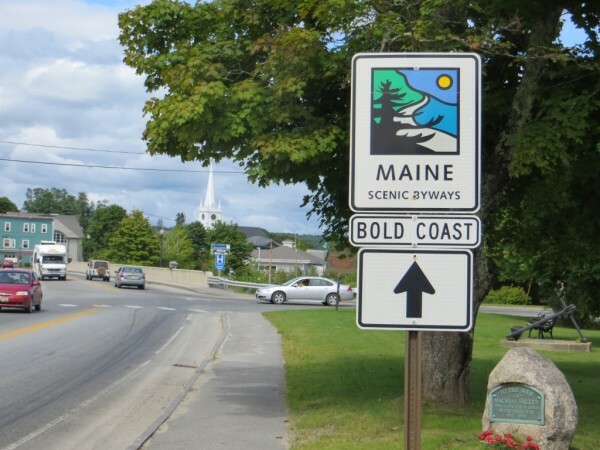 This sign for the Bold Coast Scenic Byway is posted in Machias. The byway runs from Milbridge to Lubec, including portions of Route 1 and some of the peninsulas. 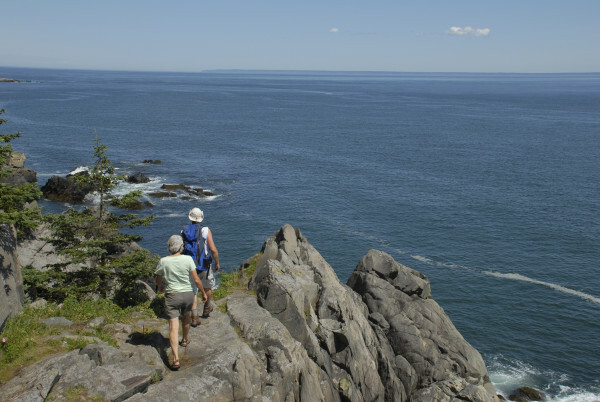 After hiking more than a mile through a thick spruce-fir forest, two hikers emerge onto the jagged gray granite cliffs of the Bold Coast Trail inside the Cutler Coast Public Preserve Land in this August 2009 file photo. MILBRIDGE, Maine — Officials are hoping a new marketing plan will increase tourism in the Down East area. “I’m definitely hoping it will raise awareness of the region’s offerings for local, in-state, and out-of-state visitors,” said Crystal Hitchings, regional planner and grant administrator for the Washington County Council of Governments and DownEast & Acadia Regional Tourism, which are working together to market the Bold Coast Scenic Byway. The byway starts in Milbridge and follows Route 1 to Columbia Falls and takes Route 187 to Jonesport. Then, it goes back onto Route 1 to East Machias, where it takes Route 191 to Cutler to Route 189 to Lubec. It also includes a loop that goes from 189 back to Route 1 and then onto Route 190 to Eastport. “Welcome to the Bold Coast of Maine, where the journey is the destination,” reads the new Bold Coast Scenic Byway website, created as part of the marketing plan. The plan also resulted in the creation of brochures for the area. The two organizations worked on the marketing plan for about three or four years and finished it last spring, Hitchings said. At the same time, the groups also completed an action plan and capital improvement plan, which identify items such as a needed visitor center in Milbridge, considered to be a “gateway” community to the Bold Coast. They also are working with officials in Cherryfield, also considered a gateway community, to develop a visitor center and railroad museum. Hitchings said it is difficult to tell whether the completion of the marketing plan has had any economic impact over the past year. However, the plans and planning process did result in Bike Maine’s decision to hold this year’s event in the Bold Coast region, Hitchings said. During this event, held Sept. 10-17, about 400 cyclists will ride about 350 miles along the Bold Coast Scenic Byway, according to the Bike Maine 2016 website. Riders will start and finish at the Schoodic Institute in Winter Harbor and will make stops in Jonesport, Machias, Eastport, Lubec and Milbridge. This will bring a big economic boost to the area, she said. Hitchings also wants the marketing plan to boost the reputation of the Down East area. “Washington County is rich in cultural and natural assets, and although we have our issues, we are far more than only our challenges,” she said.